Back row, from left: coach Brian Frechman, Kalli Crowder, Zakara Cooper, Jazlyn Alcantar, Addi Ames, Shayna Chan, Dulci Vail, coach Mark Del Rosario; front row: KK Lacanlale, Jadee Salvador, Ella Del Rosario, Sophie Chinn and Natalie Frechman. 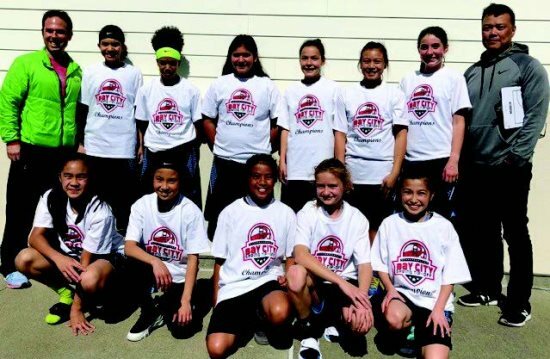 The 5th Grade AAU Bay Area Blitz girls basketball team were dominant in winning the Bay City Spring Tipoff tournament held the weekend of March 24 in Pacifica. The girls went undefeated, beating Southern California's No. 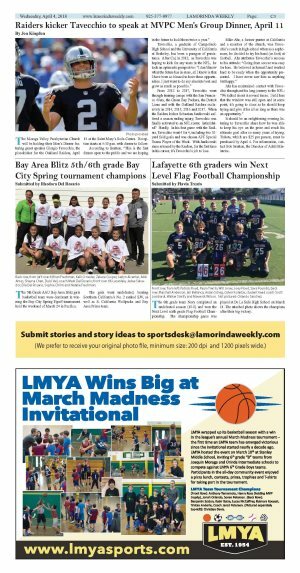 2 ranked SJV, as well as S. California Wolfpacks and Bay Area Prime team.